Launched in January 2014, Cairography is the first edition of a publication series that seeks to enhance the discursive exchange on performances practices in the Arab and Western worlds, crossing language barriers. 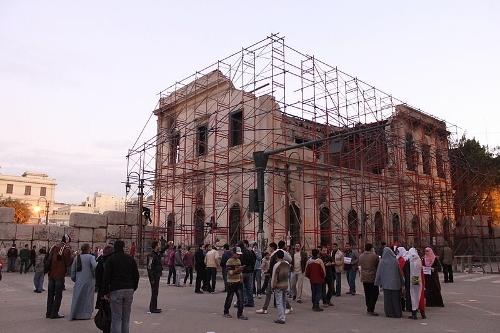 The destruction of archives and cultural infrastructure in post-revolutionary Egypt has made lingering issues all the more urgent. Quotidian languages and vernacular culture barely find representation in the Arab world, as they are dismissed by hegemonic institutions. A lack of accessibility to documents and archives prevents research on the history of contemporary art practices. Who owns history? How can one create visibility for contemporary practices of resistance, self-empowerment and critical reflection? 'Cairography' reflects on these issues and on the ensuing "moments of difficulty and self-exile, forgetting and remembering, solitude and finding intimacy." The collection was edited by Adham Hafez and Ismail Fayed of HaRaKa in Cairo and appears both in English and in Arabic. For Sarma, it is the first text collection in Arabic to become part of its archive. Cairography was initiated by HaRaKa in Cairo and produced by ARC.HIVE. This edition was made in collaboration with and through the support of Sarma. With the additional support of Dalila Kerdany, Sherine Malak Blecua, Hala Imam, Oumnia Abaza. As Arab artistic practices are situated within various languages, how do these conditions affect their visibility in the production of discourse? The Egyptian choreographer and composer Adham Hafez frames the pilot issue of Cairography. Egyptian demographer and researcher Sawsan Gad has studied the dancing body in relation with urban realities. She reminds us of the language abyss Egyptians live within and how it governs their lives and dreams. In a lecture from 2007, the British dance historian Ramsay Burt revisits migration as choreography, and opens scores of movement from different worlds and times, in a historiographic questioning of the dance films 'Ellis Island' by Meredith Monk, and 'Three' by Isaac Julien. How do people in the Cyber-era choose to remember narratives and images from the past in current discourses? The Egyptian dramaturge and critic Ismail Fayed delves into the visual memory of a people, in times of change. Egyptian visual artist and researcher Doa Aly raises crucial questions on what kind of artistic production takes place in revolutionary times, and on the response of artists to historical events and rising markets. In this essay from 2007 on collaborations, negotiations and representing social changes, Belgian writer and dramaturge Jeroen Peeters opens up a terrain of questions. Turkish dramaturge and researcher Aylin Kalem interviewed the pioneering Turkish choreographer Aydin Teker and her dancer Ayse Orhon in 2008 about the unique relations to objects they establish in their work. Why are Arab artists today so often requested by the international markets to produce 'political performances'? The Palestinian Egyptian author and anthropologist Abdullah Al-Bayyari reflects on the political nature of the bodies of dancers, martyrs and citizens in Arab cities. Between solitude and multiplicity, the Belgian performance maker and writer Myriam Van Imschoot examines in an early essay (1999) the format of the 'solo' and the impossibility of its existence.